According to Ryan Holiday, Ego is an unhealthy belief in our self-importance. In this course, it is not “Who do I want to be in life?” but “What is it that I want to accomplish in life?” Setting aside selfish interest, it asks: What calling does it serve? What principles govern my choices? Do I want to be like everyone else or do I want to do something different? The mixed martial arts pioneer and multi-title champion Frank Shamrock have a system he trains fighters in that he calls plus, minus, and equal. Each fighter, to become great, he said, needs to have someone better than them- they can learn from, someone lesser who they can teach, and someone equal that they can challenge themselves against. A true student is like a sponge. Absorbing what goes on around him, filtering it, latching on to what he can hold. A student is self-critical and self-motivated, always trying to improve his understanding so that he can move on to the next topic, the next challenge. A real student is also his own teacher and his own critic. There is no room for the ego there. What humans require in our ascent is purpose and realism. Purpose, you could say, is like passion with boundaries. Realism is detachment and perspective. When you want to do something-something big and important and meaningful—you will be subjected to treatment ranging from indifference to outright sabotage. Count on it. The question to ask, when you feel pride, then, is this: What am I missing right now that a more humble person might see? What am I avoiding, or running from, with my bluster, franticness, and embellishments? It is far better to ask and answer these questions now, with the stakes still low, than it will be later. Don’t fake it till you make it. Make it so you don’t have to fake it. Pick up a book on a topic you know next to nothing about. Put yourself in rooms where you’re the least knowledgeable person. That uncomfortable feeling, that defensiveness that you feel when your most deeply held assumptions are challenged—what about subjecting yourself to it deliberately? Change your mind. Change your surroundings. Instead of pretending that we are living some great story, we must remain focused on the execution—and on executing with excellence. We must shun the false crown and continue working on what got us here. It’s not about beating the other guy. It’s not about having more than the others. It’s about being what you are, and being as good as possible at it, without succumbing to all the things that draw you away from it. It’s about going where you set out to go. About accomplishing the most that you’re capable of in what you choose. That’s it. No more and no less. According to Robert Greene, there are two types of time in our lives: dead time, when people are passive and waiting, and alive time, when people are learning and acting and utilizing every second. Every moment of failure, every moment or situation that we did not deliberately choose or control, presents this choice: Alive time. Dead time. P.S. 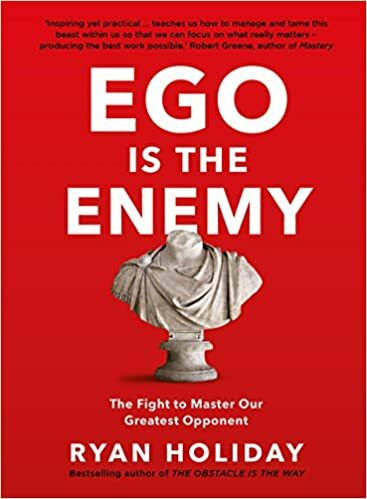 This is my book summary of “Ego is the Enemy”. These points could be direct quotes from the book, and/or my thoughts and interpretation of those lines. Importantly, this write-up is dedicated to the key points from this book.